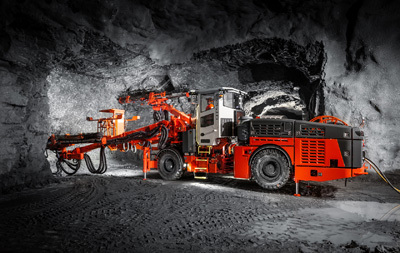 Sandvik Construction is introducing a completely new tunnelling jumbo to its extensive offering: the new, fully automated, DT922i tunnelling jumbo. This will bring to customers true tunnelling quality, reliability and exceptional versatility. With a new articulated carrier, it features a next generation cabin supplying 25 % increased visibility, and noise level of less than 69 dB at all times. 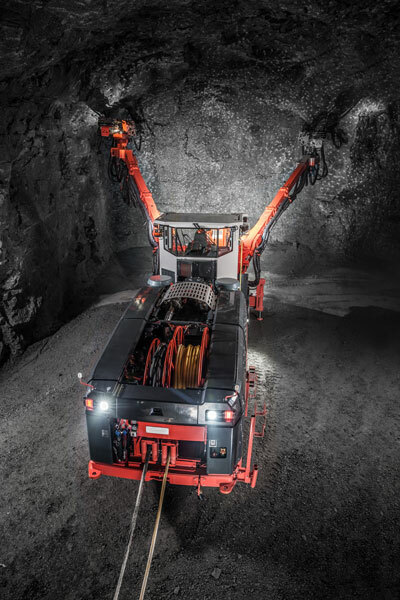 Intelligent, state-of-the-art control system, and Sandvik’s iSURE excavation management tool, create a combination which will change the future of tunnelling. The DT922i comes with many new features that increase productivity simply through the machine’s genuine adaptability to different working sites. The new articulated carrier enables the jumbo to operate in tight tunnels with narrow corners. Moreover, the new optional cabin lifting system gives improved visibility, but at the same time allows to tram in low tunnels. The hydrostatic transmission system and joystick control enables very precise dynamic control of tramming speed and steering. The practical multi-voltage concept for different electric voltages allows easy and fast shift to different working sites. 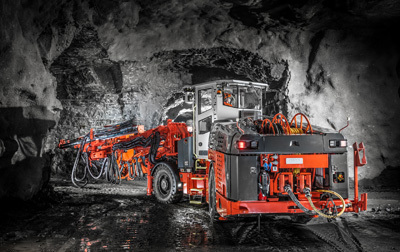 Combined with the efficient RD525 rock drill, intelligent drilling and boom control systems, as well as the iSURE tunnel management system, the DT922i offers an unbeatable combination for any tunnel excavation. 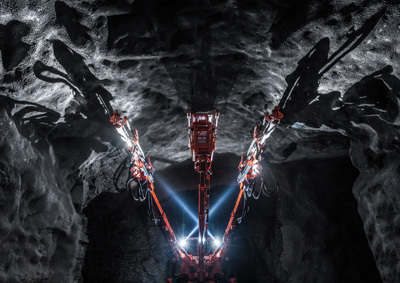 Equipped with the powerful Sandvik RD525 rock drill which provides 17 % higher penetration rates, 40 % longer tool life for the shank, as well as 17 % for the bits (when compared to its predecessors), the DT922i delivers superb performance in any conditions. Its two accurate SB100i booms are equipped with stiff square shape profile giving maximized support to the rock drills and further add to the precision in drilling. Operator comfort with modern, ergonomic cabin and state-of-the-art user interface The DT922i’s brand new cabin comes with improved ergonomics and maximized safety. The new design delivers 25 % greater visibility sector, reduced dust levels and provides more operator space. With noise levels less than 69 dB at all times, it thus supplies a comfortable and safe working environment for the operator. Additionally the new state-of-the-art user interface, with touchscreen, is easy to work displaying comprehensive diagnostics with all drilling and carrier parameters split into logical subsystems and shown on one display. Environmental, health and safety issues have not been forgotten in the design of the new DT922i. All lights of the new jumbo are based on LED-technology, which when compared to the more commonly used High Intensity Discharge (HID) lights, have up to 500 % increased lifetime, and consume 50 % less energy. In addition, the laser scanner access detection system optimizes personnel safety. The DT922i is available with the fuel efficient and emissions friendly Tier 3 diesel engine (119 kW) as standard, or the optional Tier 4 Final (122 kW), which provides even greater levels of reduced emissions, with the power pack consisting of two 75kW IE3 compliant electric motors. These being just examples of the new jumbo’s EHS-features, which enable the DT922i to be a trailblazer in modern underground drilling, not just from a productivity perspective but also an EHS one. Two automation levels are also offered: gold and platinum. The standard gold package facilitates drilling according to predefined drill plans. This automation level includes features such as drilling to predefined depth, drill plan visualization, rig navigation and an option for automatic long hole drilling. It also integrates the iSURE tunnel management tool for creating accurate plans for drilling, charging and blasting, as well as data collection and analysis tool for improving work cycle and process. The enhanced platinum package includes all features from the gold package, but enables full automatic face drilling with “iDATA”. The new DT922i tunnelling jumbo is set to be introduced during the second and third quarters of 2015 at several local customer focused events around the world. Hydraulic rock drill Sandvik RD525 Drill feed Sandvik TF5i (14’ to 20’) Boom Sandvik SB100i Control system Sandvik SICA Automation levels Gold (standard) / Platinum (optional) packages Coverage area 14 800 x 9 000 mm (125m²) Hole length Up to 5 880 mm Turning width (T-section) 5 300 mm Transport / drilling width 2 500 mm* / 3 500 mm Transport height 3 190 mm** / 3 590 mm Transport length 14 990 mm Total weight 30 000 kg (depending on options) * 2 570 mm with THR. ** Minimum 3 190 mm with cabin lifting system.